So, I belong to the Bernard Herrmann Society page on Facebook--as you should--and Dirk Wickenden, of Kent, published this beautiful appreciation of Herrmann's work on François Roland Truffaut's Fahrenheit 451. It is a thing we can't talk about, exactly: this intersection among image, music, and idea. Sound-image. Saussure spoke--as we know from his students' notes--of the sound-image, but we never seem to speak of the incredible accomplishment of the great score-writers and their attempt--sometimes well-intentioned and failing, sometimes better than the image being supported--to further the diegesis, the image, the audience, the now-place; the flavor, the texture, the smell--yes, I said the smell--and the possibility of film through sound. The image, somehow, as sound. Sound-image. Herrmann may have been the sublime possibility, suggestion, and ending of all these intractable ideas. This clip is incandescently gorgeous. It sounds very much like Bernard Herrmann. It is a repetition without being a canon. It is as though every time the theme comes back again, the composer can't let it go. It is the most searchingly wonderful passage. I love it. Please, listen to this. I wrote to Dirk Wickenden, today, just to ask to quote him, so you could read him. Just so you could listen. 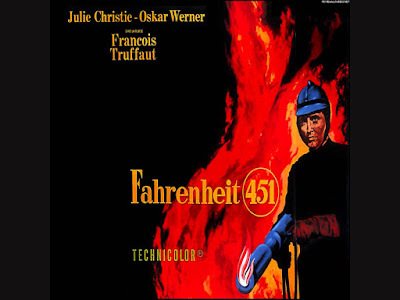 Fahrenheit 451: In this one cue, supporting a closing montage, Herrmann manages to comment on the characters' feelings of love for books and knowledge, the possible emerging love of the two main characters and the melancholy feelings of a group of people who are trying to keep the essence of an author's words alive. It is beautiful but sad at the same time.